With one foot in the early history of bluegrass and the other in Western swing, this historic Texas recording group of the ’20s and ’30s has earned a place in American musical history every bit as heroic as the epic last stand at the Alamo. 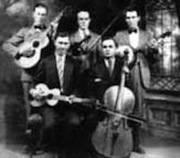 Among many distinctions, the East Texas Serenaders were one of the few early Western groups to feature cello, played by Henry Bogan. Note the use of the word “early” in the previous sentence, because by the end of the ’30s, the cello had became a complete no-show in country music. The group also featured tenor banjo as well as the expected guitar and fiddle. The main recorded document of this group is the Complete Recorded Works issued by Document; but most listeners come into contact via a fleeting glimpse offered on any number of compilations, ranging from the narrow focus of old-time Texas string bands, in which the group certainly has historic presence, to massive multi-disc overviews of the entire history of American pop music, in which the East Texas Serenaders occupy a valuable niche as well.